La Dolce Vita is an impressive 30.48m motor yacht featuring quality naval architecture and exterior design, fully accommodating guests and crew comfortably, ensuring a relaxed and luxurious charter experience. 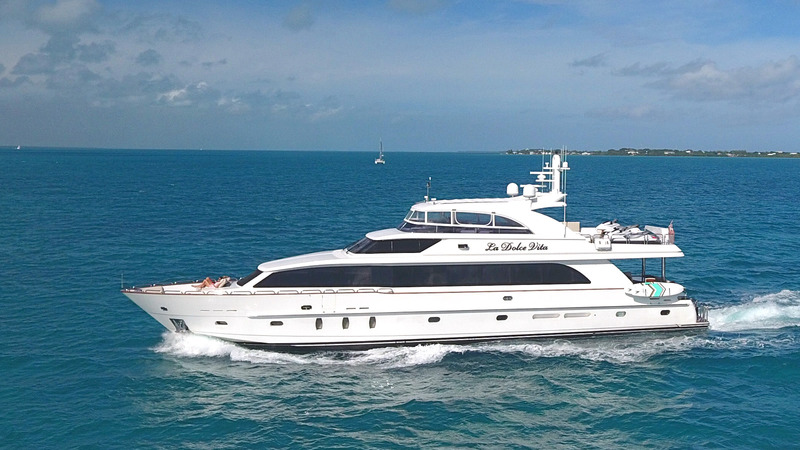 This 100’ Hargrave Raised Pilothouse boasts several unique features. Her exterior has elegant distinct lines with seamless windows. The open flybridge with convertible top is just as great to admire as it is to enjoy. The yacht’s most prominent colors include Camphoe Burl Wood and Gloss Cherry Wood with accents of taupe, cream or slate blue. La Dolce Vita comfortably accommodates 8 guests in four staterooms, all with ensuite bathrooms with delicately worked marble stonework. The master stateroom is a luxurious full-beam suite with a king sized bed and his-and-hers bathroom. The VIP stateroom offers a cozy privacy away from the yacht’s other three cabins. The aft guest cabins can be used as both a queen and a flexible queen/twin, featuring a pullman berth crafted in gloss cherry. Headroom on La Dolce Vita is at least seven feet two inches throughout.